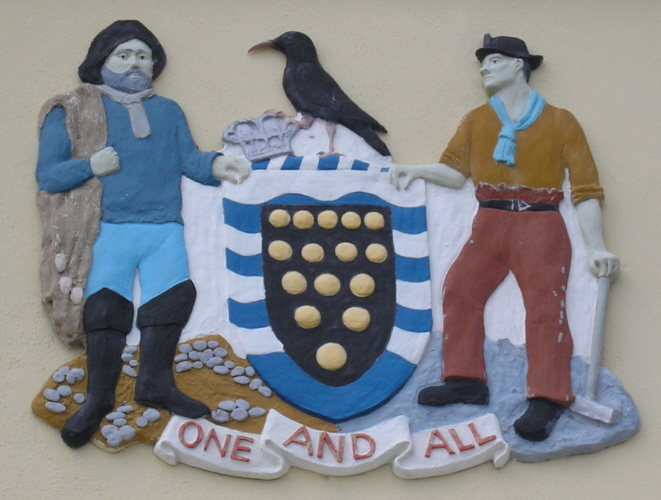 The Arms of Cornwall County Council as displayed at Land’s End. Arms: Sable fifteen Bezants in pile within a Bordure barry wavy of eight Argent and Azure. Crest: On a Wreath Argent and Azure a Chough proper resting the dexter claw upon a Ducal Coronet Or. Supporters: On the dexter side a Fisherman holding over the exterior shoulder a net and on the sinister side a Miner resting the exterior hand on a sledge hammer all proper. 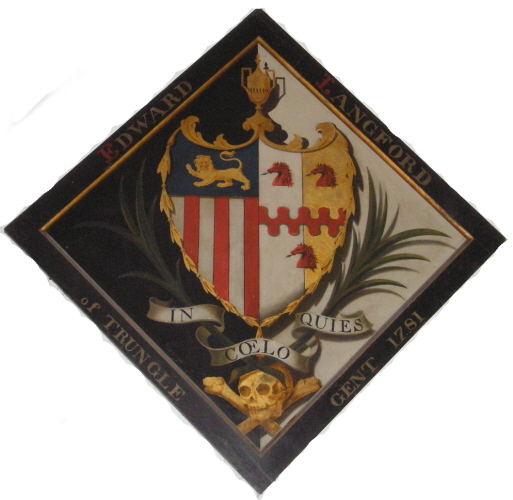 The Arms were granted 5th April 1939. Another “missed” set of photographs, this time from a visit to Uppark House, near Petersfield, Hampshire in 2007. 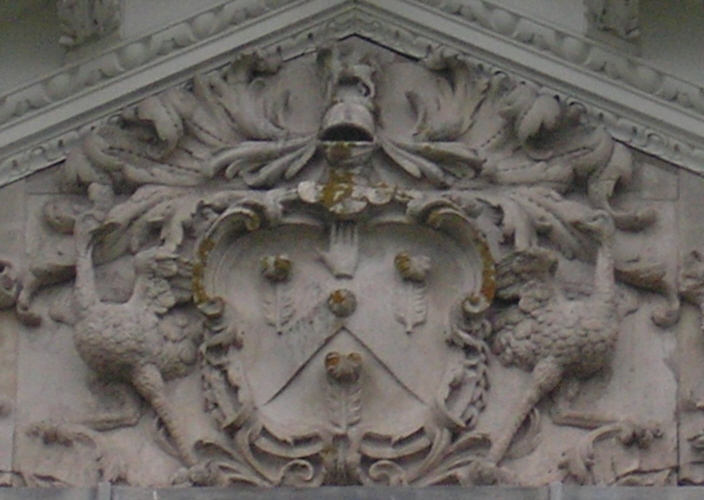 Arms: Gules on chevron between three ostrich feathers Argent an ogres. 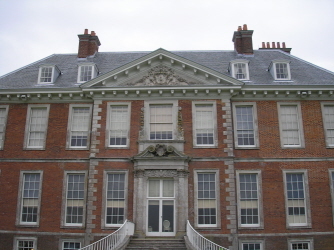 The Uppark estate was purchased in 1747 by Sir Matthew Fetherstonhaugh Bt who set about extensive improvements. The estate then passed to the colourful Sir Henry/Harry Fetherstonhaugh Bt who married his dairy maid, Mary Ann Bullock. 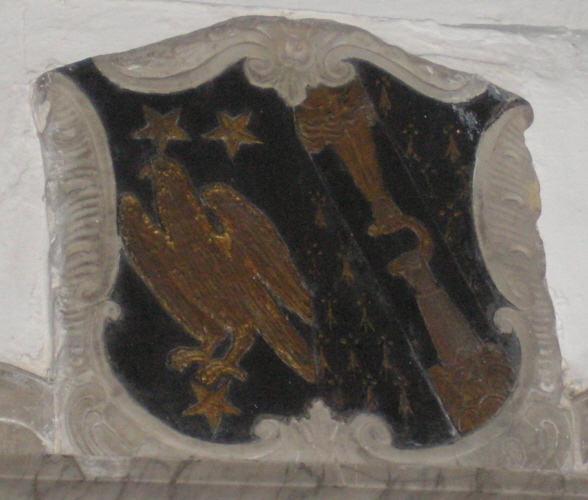 Their funeral hatchments are in St Mary’s Church, South Harting. 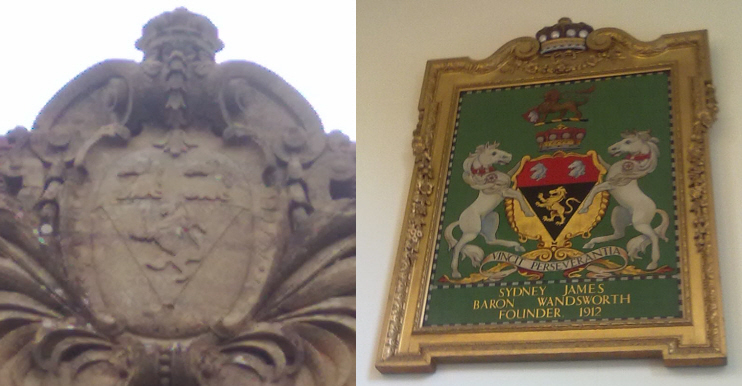 Another monument in Paul Church is to Henry Pendarves, his wife, Maria Borlase (b. 1669 d.1759), and their daughter Margaret (b.1701 d.1742). Henry was the son of Thomas Samuel Pendarves of Roscrow. Maria was the daughter of John Borlase of Pendeen. Margaret married the Rev’d Walter Borlase [I’ve not found the family relationship]. 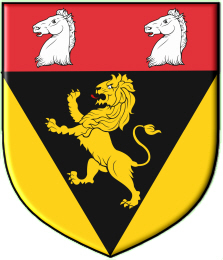 Pean¹ on a bend Sable two hands and arms ² issuing out of the clouds at the elbows rending a horsehoe Or (Borlase). 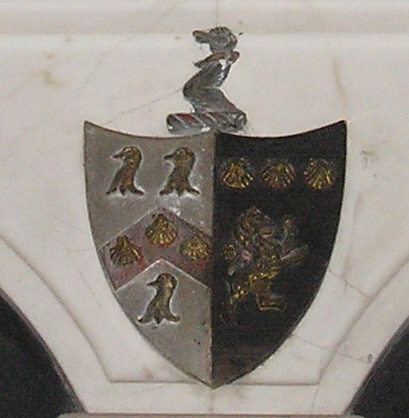 The Arms for Pendarves were recorded in the Visitation of Cornwall in 1620. 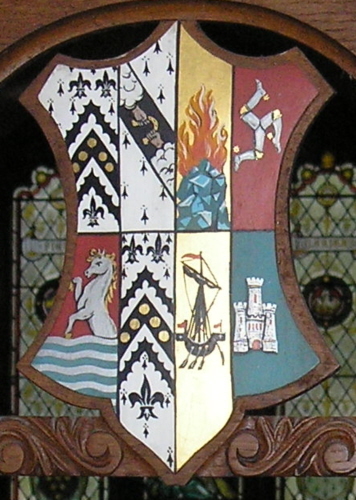 The Borlase Arms, as displayed differ, from the entries in Burke’s General Armory: – ¹ Ermine & ² All proper. Crest: A spear broken in three pieces Or two in saltire the other in pale headed proper banded together at the middle by a ribbon Gules. 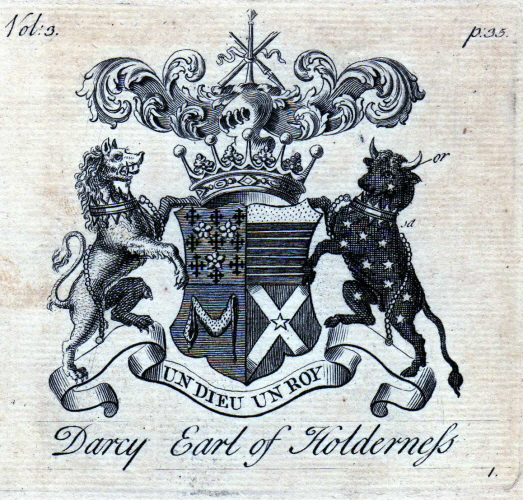 Conyers Darcy, 1st Earl of Holderness, 2nd Baron Darcy of Meinhill, 8th Baron Darcy de Knayth and 5th Baron Conyers (24 January 1598/1599-14 June 1689) was created Earl of Holderness in 1682.